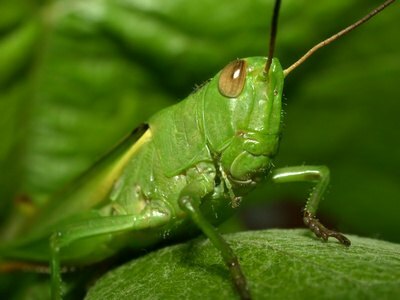 Grasshoppers are insects that can be distinguished from locusts, crickets and katydids by antennae that are shorter than their bodies. There are 61 species of grasshoppers in Michigan, all of the acrididae family. 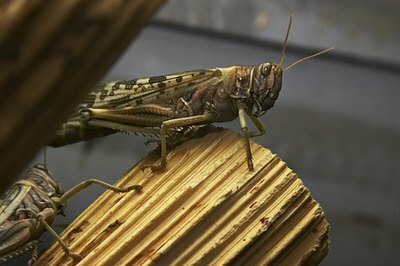 Michigan grasshoppers spend winter as eggs and hatch in the spring or summer to feed on plants. They can damage grazing land and cash crops such as wheat, oats, barley, corn, vegetables and ornamental plants. 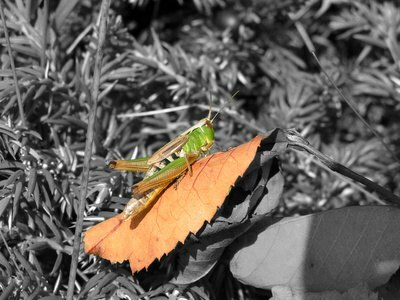 Grasshoppers defend themselves by biting, kicking out with their hind legs, jumping and regurgitation. Grasshoppers come in several varieties. The two-striped grasshopper (Melanoplus bivittatus) is a grasshopper that hatches early in the spring, usually by the end of May. It is greenish-yellow with black or brown markings. Two light yellow stripes extend from the head to the wing tips. They eat many types of grass, flowers and vegetables, often destroying Michigan's corn, alfalfa, and small grain crops by eating all the foliage from the plants. They are active only during the day. A two-striped grasshopper works during the day. Red-legged grasshoppers (Melanoplus femurrubrum) are medium-size grasshoppers that usually hatch about three weeks after two-striped grasshoppers. They range in color from brown to black with a reddish brown back, yellow belly, and bright red rear legs. Most Michigan red-legged grasshoppers have yellow wings with a red disk and black band on the rear wings. They are active during the day, starting to feed about 7 a.m. and climbing vegetation between 4:30 and 5 p.m. to roost for the night. They fly 3 to 4 feet above vegetation for distances up to 40 feet before landing. Red-legged grasshoppers eat soybeans, alfalfa, grass, clover, small grains, vegetables and legumes. Red-legged grasshoppers have yellow bellies. Migratory grasshoppers (Melanoplus sanguinipes) are medium-size grasshoppers that hatch in June. They are light green, gray, or tan and are known to form swarms that migrate over a long distance in search of food. Their wings are transparent with black stripes, and they have black knees. 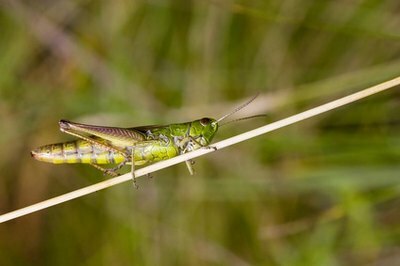 Migratory grasshoppers can damage grassland, crops, gardens, meadows and range land. They also eat shrubs, vines, and trees, including the fruit and bark. 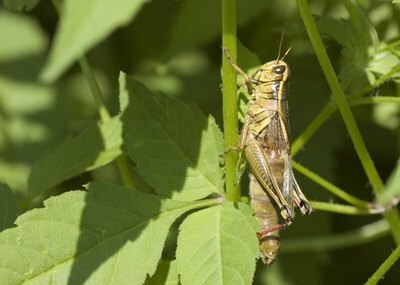 Migratory grasshoppers can wreak havoc on crops. The clear-winged grasshopper (Camnula pellucida) is a medium-size grasshopper that hatches early in June. Males are yellow to brown with a black patch on the shoulder above the front legs. Females are dull brown to tan. Both males and females have transparent wings with dark blotches and white lines and dark bands on the rear legs. Clear-winged grasshoppers eat grass and cereal crops. They can fly a long distance to find more food sources. Clear-winged grasshoppers eat cereal crops.